Putting a face on a fossil is a significant part of any paleo-project. The face – whether a reconstruction, a sketch, a diorama, or a model – takes a static object (the original fossil) and gives it dimensionality, a body, even a persona as viewers project emotion and feeling onto the reconstruction. Putting a face on a fossil transforms the object into something dynamic. Putting a face on the Taung Child began rather early in the fossil’s life. In 1925, South African scientist, Dr. Robert Broom, visited Dr. Raymond Dart at the University of Witwatersrand to discuss the Taung fossil and its evolutionary significance. 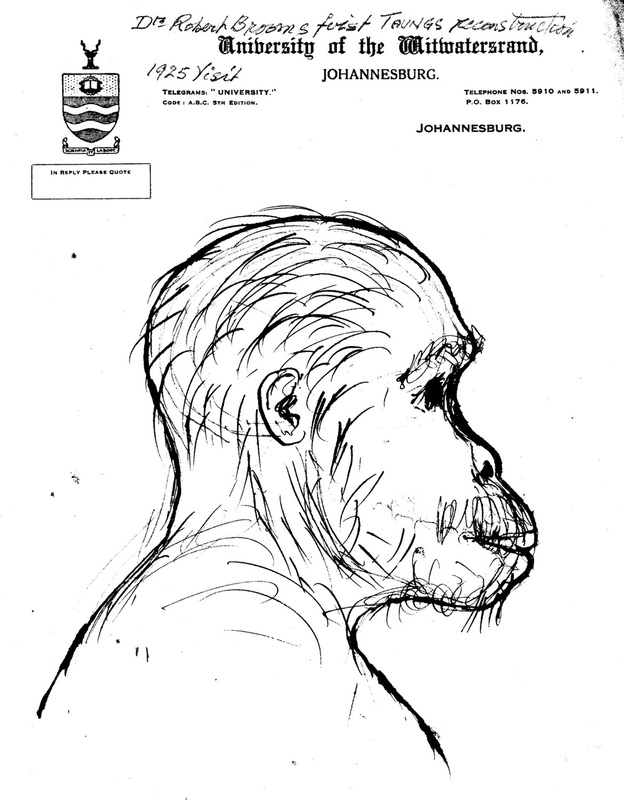 Dart kept Broom’s sketches of what Broom imagined the young australopith to look like. And on a lighter more comical note, Dart kept this framed sketch of the of a young, impish Puck-like sprite of a hominid in his office at the university. The sketch is undated, but correlates with other sketches and papers from the late 1920s. In December of 1929, anatomist and Taung fossil curator, Raymond Dart, received a holiday note from American anthropologist, Henry Field. 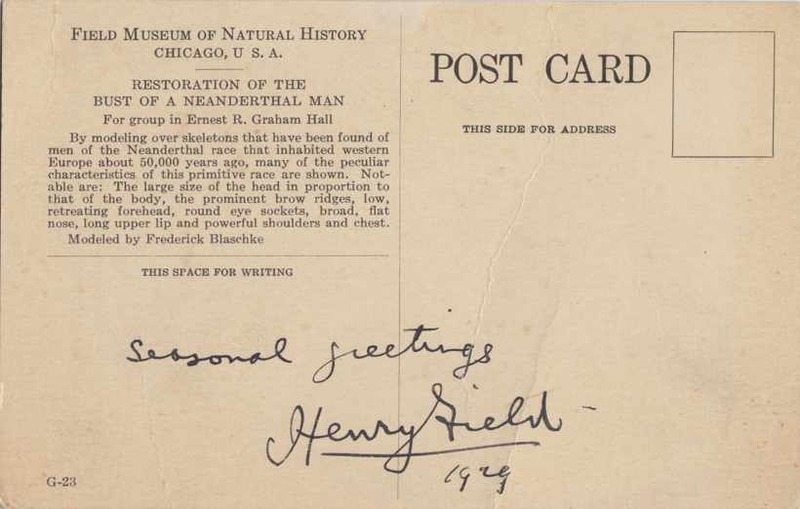 Dart rang in his New Year with a postcard portrait of one of the Field Museum’s Neanderthal models for the then-new Hall of Prehistoric Man. The Field Museum’s portrait of this Neanderthal shows an interesting interaction between the photographer (the artistic composer) and the fossil reconstruction. At first glance, we’re stuck by the “non-human” aspects of the Neanderthal in the picture. We see his nakedness and blank eyes. We see a hunching posture and an inordinately protruding browridge. And, of course, we see the trapezius muscles practically crawling out of his neck – leading us, the audience, to wonder if we've found the bouncer for the Field Museum’s Hall of Prehistoric Man. Yet there is a subtle humanization of the subject that we also see through this three-quarters view with soft backlighting. The portrait of the Neanderthal invites us to consider the idea that the Neanderthal is participating in the human ritual of portraiture rather than merely existing in landscape photography of a diorama's scene. Through portraiture, we are offered a much more “humanizing” story of the Neanderthal than the Field Museum might have originally realized. John Gurche’s Shaping Humanity: How Science, Art, and Imagination Help Us Understand Our Origins is the very embodiment of Nabokov’s sentiment. Shaping Humanity is the art and science of understanding human origins that is thoughtfully, purposefully, and brilliantly refracted through the author’s aesthetic lens. For full review here at New York Journal of Books. In 1873, paleontological illustrator Benjamin Waterhouse Hawkins added a small sketch to his personal portfolio – a pen-and-ink drawing with the title St. George and the Pterodactyl scrawled across the bottom of the scene. In this drawing, we see the famous knight engaged in a ferocious battle with a most terrible dragon – the flying dinosaur that was discovered earlier in the century and a specimen that Waterhouse Hawkins was well-familiar with from his own sculpture and museum illustrations. The sketch shows a quirky blending of nineteenth-century Romanticism and medieval iconography and, perhaps, even a bit of satire. St. George and the Pterodactyl B. Waterhouse Hawkins, 4 December 1873-Ann 4 Dec[ember] 1968. But what are we to make of Waterhouse Hawkins’s Saint George who battles a fierce but extinct animal? What are we to make of the saint in this context, this representation, this telling of the Saint George story? Traditional iconography of Saint George has several key components – an elaborate cosmological image with a clear narrative structure. Saint George and the Dragon. Novgorod School, 14th century. Russian Museum, St. Petersburg, Russia. Detail of Saint George icon from a folding illuminated book, Ethiopia (Gondar), late 17th century.&nbsp; Walters Art Museum collection, Baltimore, MD. USA. Saint George Killing the Dragon (1434-1435), Bernat Martorell. Art Institute of Chicago, Chicago, IL. USA. Reading these paintings from top to bottom provides a very clear narrative to the Saint George icon. The spiritual knight George “tames” (read, slays) the dragon, establishing order to the lower levels (forces?) of Creation. In Saint George and the Pterodactyl, we see an interesting inverted mirroring of the legend – we see the story upturned and read it reversed. St. George and the Pterodactyl, B. Waterhouse Hawkins, 4 December 1873. Museum of Natural History, Philadelphia, PA. USA. In Waterhouse Hawkins’s sketch, we see several familiar elements: Saint George, the horse, the “dragon” (e.g. the pterodactyl), light, a crown, earth, and a lower world. In contrast to other scenes of Saint George, the hero fights the reptilian foe on the left (rather than the right) of the sketch. Proportionally, the pterodactyl is huge – it’s as large as the horse and is a much more serious threat to George with it’s opening jaws and extended left claw, actually daring to do battle. (Some of the earlier dragons seem to cower in the lower corner of the scenery, simply awaiting the sweet release of death…) The Heavens are absent, the Firmament omitted, and the earth (the matter) visually overwhelming the viewer. Saint George’s halo is created by the mouth of a cave of columnar basalt (cited as Fingal’s Cave, Scotland) and the basalt continues underfoot (or, rather, underhoof) trace all the way down to the gargantuan sea octopus in the lower right of the scene. George fights the pterodactyl with a short mace (inverting the underlying geometry of traditional hagiography) while clutching a short dagger and sporting a truly spectacular nineteenth-century handlebar mustache that surely Nietzsche would have envied. I like to think that Saint George and the Pterodactyl is a late-lingering and playful nod to the American Romantic period – celebrating the wonders of natural history and the explanatory value that traditional tropes (like iconography) hold. Instead of Heaven and the Firmament, we see a cave. Instead of a princess (Andromeda), we see a sea creature (the octopus). Instead of a mythical, cowering creature (the dragon), we see extinct animals (the pterodactyl) that have come to live to claim their own place in a narrative of natural history. Saint George does not engage with his foe at lance’s length – he must be close to nature, however intimating and fraught with danger it is. The narrative is one of humanity and nature. Davidson, Jane P. A History of Paleontology Illustration. Bloomington: Indiana University Press, 2008.
iconreader. “Saint George and the Dragon in Iconography.” A Reader’s Guide to Orthodox Icons. Accessed January 2, 2014. http://iconreader.wordpress.com/2012/04/25/saint-george-and-the-dragon-in-iconography/. Temple, Richard. Icons: Divine Beauty. London: Saqi/The Temple Gallery, 2004. Vikan, Gary. Ethiopian Art: The Walters Art Museum. Third Millenium Pub Ltd, 2006.